Top Left: ASLA 2016 Professional Analysis and Planning Honor Award. The Big U, New York, NY. BIG and Starr Whitehouse Landscape Architects and Planners. Top Right: ASLA 2015 Professional General Design Honor Award. Perez Art Museum Miami: Resiliency by Design, Miami, Florida. ArquitectonicaGEO / copyright Robin Hill. Bottom Left: ASLA 2016 Professional Communications Honor Award. Sea Change: Boston, Boston, MA. Sasaki Associates. Bottom Right: Living Breakwaters, Staten Island, NY. SCAPE Landscape Architecture. 9/13/2017 – The American Society of Landscape Architects (ASLA), the professional association for landscape architects in the United States, is convening a blue ribbon panel to make comprehensive public-policy recommendations for mitigating and adapting to climate change through resilient design. Composed of 11 experts from across various disciplines, the panel will make recommendations that will ultimately save lives and affordably protect cities from future natural disasters. ASLA urges responsible policy makers to look to innovative urban design as they make infrastructure investments to make communities more resilient and better equipped to recover from disruptive climate events. ASLA has long advocated for sustainable landscape architecture at the intersection of design and smart policy, working with legislators and stakeholders on effective solutions that minimize the effects of climate change. Transportation and land planning that incorporates green infrastructure can provide critical services for communities, protecting them against flooding and excessive heat, and helping to improve air and water quality. The experts of the ASLA Blue Ribbon Panel will gather for a two-day meeting starting on Thursday, September 21 through Friday, September 22, 2017. The panel will publicly present its findings and policy recommendations in the form of a report in January 2018. Mark Dawson, FASLA, Managing Principal, Sasaki Associates Inc.
As many of you know, a bill was recently introduced in the House of Representatives that would terminate the Environmental Protection Agency. As a professional organization that advocates for and leads the stewardship, planning, and design of our built and natural environments, it is important for us to defend the future of the EPA. ASLA recently sent a letter to Representative Matt Gaetz (Florida), the author of the bill, urging him to withdraw consideration of the proposed legislation and issued a statement opposing the measure. Now we need your help. Please click here to easily send a letter to your U.S. House Rep urging them to oppose H.R. 861 which would eliminate the EPA. Forward this link on to friends and colleagues across the country too! I hope you will all join this important effort to protect our environment today. Better yet, CALL your representative! It is usually more effective to speak to government officials or meet in person. To find out who your representatives are and get contact info, go to: http://advocate.asla.org/ and type in your zip code. Last month a letter to the Mayor was publicized having been drafted by several NYC organizations to bring greater awareness and programing to public space for civic expression. Our Executive Director, Kathy Shea and I have been in conversation with Susan Chin at The Design Trust for Public Space to get involved with the efforts moving forward. Next week we will be meeting with DOT Commissioner Polly Trottenberg to discuss next steps. We will keep you posted on results of that meeting. Every year chapter presidents and trustees from across the nation meet in DC to advocate for important issues relating to our profession on Capitol Hill. Elizabeth Jordan, Adrian Smith and I will be attending and this year we will sponsor two CCNY students, Robynne Heymans and Jacqui Leboutillier to join us and experience this higher level of service. We are very excited to offer this opportunity to students as future leaders of our chapter! Interested in learning more about ASLA’s Advocacy news or following current bills? Go to http://advocate.asla.org. There you can also sign up to receive email alerts when there is an advocacy alert from ASLA. Representatives from the New York Council of Landscape Architects (NYSCLA), which includes members from our chapter and the Upstate New York chapter, travel to Albany to advocate for landscape architect’s rights. Lobby Day provides an important opportunity for NYSCLA to focus on how proposed and existing state laws and regulations will impact our environment and the profession. Attending Lobby Day is a high priority for our chapter and we welcome your input this year. As always, if you have concerns, ideas or want to be more involved in the profession, please contact us. Our Executive Board represents YOU and we are happy to have your input. 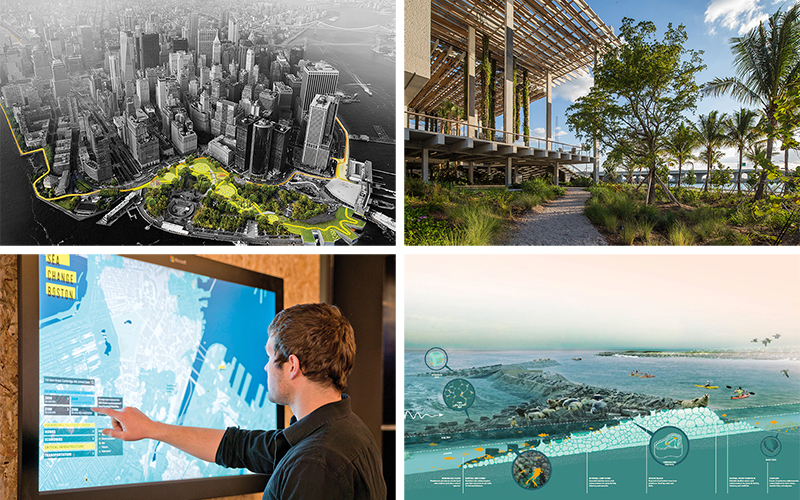 In that spirit, we offer this ASLA-NY position paper to inform our members and the public about the issues, especially in regards to New York landscapes. Our goal is to help redirect a suite of human actions which have long-term adverse impacts on pollinators to favor practices which support these very beneficial species. Pollinators include managed and wild bees, moths, wasps, butterflies, hummingbirds, bats, hornets, flies, beetles and other insects which visit flowering plants, spread pollen from flower to flower, and enable fruits, nuts, acorns, seeds and vegetables to develop. There are another 4,000 species of bees in the US in addition to the honey bee(2) and they play a critical role in pollinating ornamental plants, forests, grassland and wetland species, and food crops. Populations of many, though not all, managed and wild pollinators are in decline worldwide, resulting in a large and growing body of scientific studies documenting pollinator numbers, causes of decline and the results of strategies intended to help. New research is rapidly adding to the knowledge base for helping pollinators to recover. After reviewing some of the recent research, consulting with scientists and other advocates for pollinator-protection actions, ASLA-NY joins a number of concerned organizations(3) which have issued papers and guidelines for reversing the trend, and helping these populations recover. As additional information becomes available, ASLA-NY’s position may be revised in response to new evidence. We write you today due to our concern with the proposed expansion of the American Museum of Natural History in Theodore Roosevelt Park. The welfare of the neighborhood surrounding the park is enhanced by the existence and vitality of this treasured green space, designed by well-known New York landscape architect, Judith Heinz. DK Eyewitness Top Ten tour guides labeled the park one of the top ten oases in New York City and we believe it is in the best interest of the city that it be preserved. When the City Council voted in 2013 to limit the operating permit of Madison Square Garden to ten years, the American Society of Landscape Architects New York Chapter (ASLA-NY) joined with the Municipal Art Society (MAS) and Regional Plan Association (RPA) to call for a long-range planning effort for this iconic location. We continue to support MAS’ leadership and urge you to consider sustainability, adaptability to future uses, and the incorporation of green space in planning a new Penn Station. The new structure must be designed with high levels of sustainable and high-performance standards for the site and its users. It should be an energy-efficient building with good indoor air quality – one that incorporates green space, a green roof and possibly green walls. The site should be designed for proper storm water management to reduce/reuse water before going into drainpipes. The new building should have a graceful interface with the pedestrian environment and be complemented by quality public open spaces contributing to the city’s cultural life. We ask that you immediately start a comprehensive planning study for the area, including the U.S. Post Office site, underground spaces and surfaces with the potential for new green space and plazas. ASLA-NY welcomes the opportunity to assist in the effort to create a redevelopment plan which serves the city well economically, environmentally and culturally. Landscape architects are trained and skilled in the planning and design of our urban environments and public spaces. We bring expertise to the table to help devise the best plans for Penn Station and will collaborate with all appropriate city agencies and professional representatives, as well as the community. Thank you in advance for your efforts to create a more efficient, environmentally responsible, fair and just city. Let’s make Penn Station an example of excellent coordination and planning.